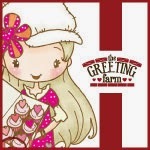 Today's release is definitely a milestone for The Greeting Farm as it marks our FIFTH birthday! Happy Birthday to us! As you've seen from this month's previews, we are going all-out to celebrate with three BIRTHDAY-themed releases and they are available NOW in the TGF STORE! Whether you want to GO BIG with the new Frou Frou line, classic with Birthday Anya 3,or get 'clearly' creative with the new Birthday cake stackers, there's a little something for everyone this release as we prepare to PARTY! There will be a few birthday surprises on the Farm this month, so stay tuned, but in order to kick start today's party and this month's fab release, we're celebrating with our DT Blog Hop as usual! There's a lot to celebrate today, so because we are so excited, we have FIVE prizes for our FIVE years! Three random digis of choice will be given away for completing the hop today, as well as TWO grand prizes of the ENTIRE AUGUST RELEASE! Just be sure to head down this list , and then back to the TGF BLOG, letting us know that you finished the hop. You have until 11:45pm CSTto finish hopping and we'll announce the winners during FFF Tomorrow. WOO HOO! Thank you so much for celebratingTGF's big day with us! As always, it's because of you that TGF is turning 5 with style and success! Here's to the next 5! Thank you all! 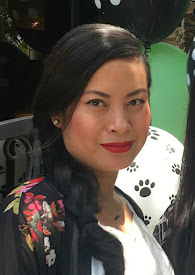 MyStyleStamps - "You're Groovy" & "Happy Days"
Hello, it's me again. I've got another card share for you before this day is over. This card is using the MyStyleStamps - Sock Hop Set. The original image of the girl is not wearing glasses, but one of the accessories included in the set is this image with the glasses/eyes by itself. I fussy cut the glasses image and layered it over the eyes. I used some misc. Polaroid, Heart and Reading Glasses dies. The Glasses die was almost a perfect match to the one that she's wearing. I added some dots to the corner of the glasses on the stamped image. For the die cut, I added some mini pearls. Her blouse and scarf is paper pieced with some pattern paper. The sentiment "You're Groovy" comes in the set, the phrase is actually on one line, I just cut it in half to separate the two words so that I can stamp "groovy" below the "you're". They're clear stamps, so it would be easy to stamp it side by side if I choose to do so. When you get a chance, go visit the MyStyleStamps Blog and MSS Shop. Hey everyone, it's Day 2 of our TGF August Previews. Here is the Clear Birthday Set. If you go see the other Designers' projects, you can see how versatile this stamp set really is. 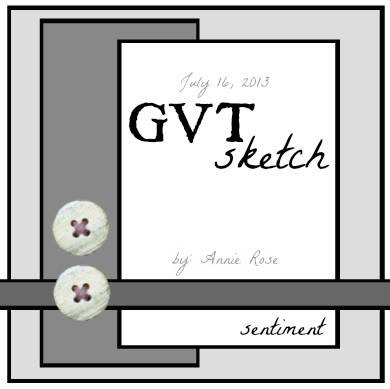 Included in the stamp set is this gumdrop image. Gumdrop image? You don't see it on my card? Well I decided to flip it and it was perfect for a strawberry. I just added some green flicks with my Copic marker for the leaves and viola! 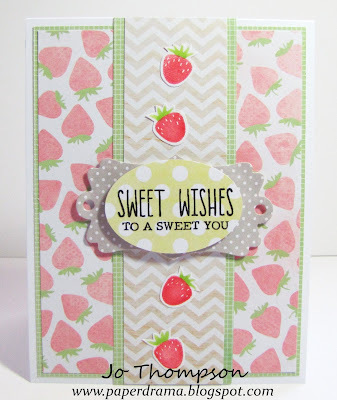 The "Sweet Wishes" sentiment is also in this set. 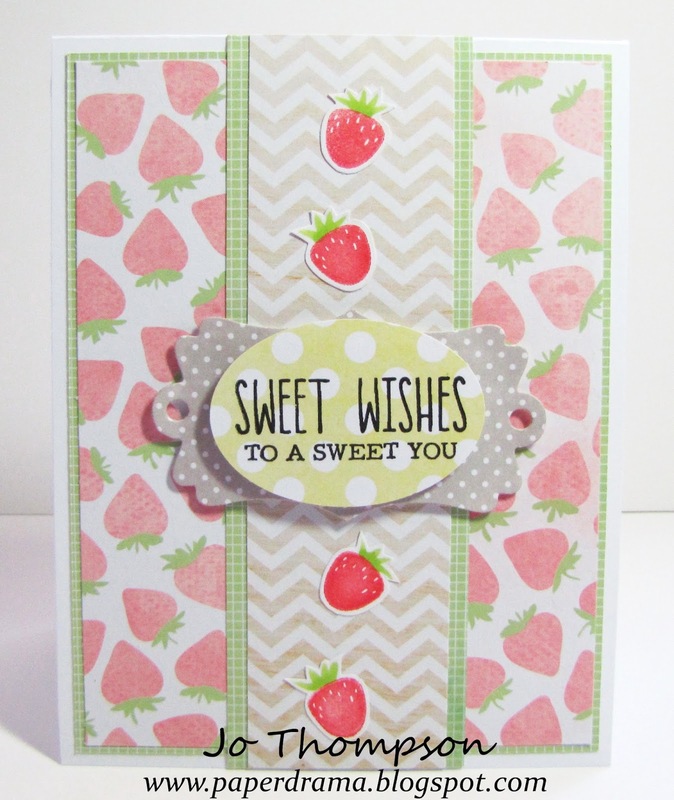 For my second card, I used the "strawberries" for the topping of my cake. I masked the images in order to stamp the sparklers in the background. There are three different sizes of the layered cakes and two different patterns each per size. I only used two layers and the cake pedastal. This cake looks yummy to eat. There you have it, my sweet preview for the August Release. If you would like a chance to win this set, visit The Greeting Farm Blog and comment to win. over at the The Greeting Farm. It can't get any more Clean And Simple, well I'm sure it can but this is my card. The lovely gal that I'm using is Fancy Anya. She is colored with my Copics, her dress and barrette are paper pieced and covered with some Stickles. I kept the layering in the background to a minimum, added some flat back pearls and seam binding. This challenge is easy, keep it Clean, keep it Simple and enter to win! Head on over to the TGF Blog. Today's challenge is Lace and Pearls. 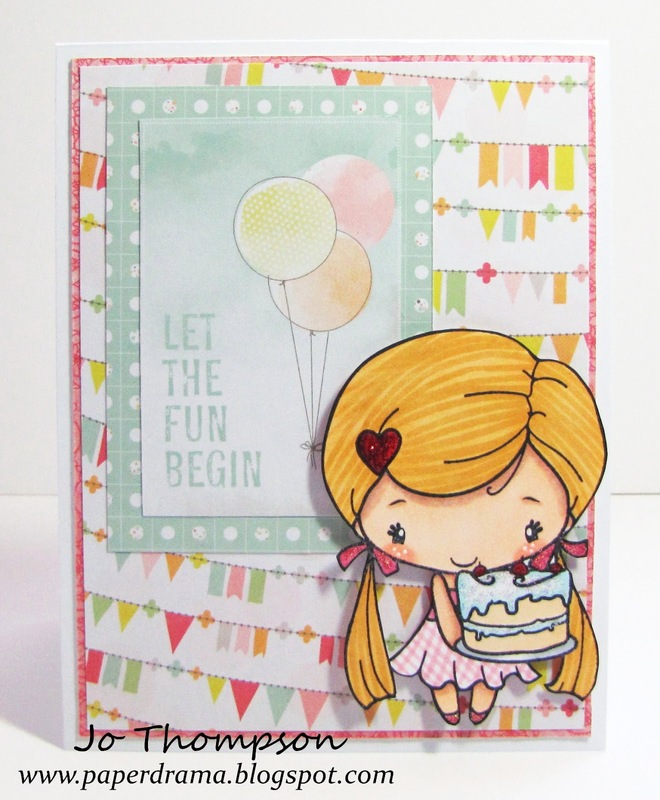 This card features Blush Babette. I embellished her hair and outfit with some mini pearls. She's colored with Copics and her outfit is paper pieced. I layered to die cuts from Spellbinders and place them on dimensional foam dots. I had some resin roses that matched the colors of the pattern paper that I used. The lace trim is an old one from Webster's Pages, may fave from their line. I just kept the layering simple since the pattern on the designer paper had a lot going on. Girly and dainty is how I would describe my card. Come join us over at the TGF Blog for this challenge and enter to win! SURPRISE!! Some of you may know that our awesome DT Creative Coordinator Jessica Diedrich is expecting and we wanted to surprise her with this Shower Hop. So with that being said, the theme is baby =) With a baby shower in mind, I decorated a mason jar mug as a favor and created a coordinating card. I love the color purple, so I left everything else muted down and had the purple be the pop of color. I used the Baby Anya & Ian stamp set. I paper pieced her outfit and colored everything else with my Copics. In the background, I used the Baby Onesie Die. For the party favor, I used a mason jar mug that I purchased at the .99 Store. I just filled it up with tulle, you can put candy or whatever you want in it. I used the same Onesie die and the same image as on the card. Instead of coloring another image, I just made a photo copy and used that. This saves you time and wasting your ink when you have to make multiples of something. It still looks cute, the color is a little bit toned down but looks just as good as the original. I added a satin ribbon on the lip of the jar to finish it off. Okay, now to the fun part. To celebrate Baby Boo, Marie (The Owner) is generously giving away a Onesie Die Cut Set to one lucky hopper! Make sure to visit all the Designers and comment. Click on the links below. Happy hopping everyone! *The Blog Hop will close 11:30pm (CST) Friday, July 19th. The winner will be announced on Saturday. What's up Tuesday! Come and join us for our Garden Variety Tuesday Challenge over at The Greeting Farm. It's sketch time! This one is from the talented Annie Rose. Here is my card using CC Tuesday Premiere. She may look a little different, she went and got her hurr did! LOL. Growing up playing with Barbie's, I never could leave their long and luscious hair alone, I would always chop it off. I guess some habits never die, hehehe. I gave her a cute little trim or she could have it in a loose bun =) Anywhoo, she's all fancied up for a party. The image is colored with my Copics and glittered with my Stickles. Come over to the TGF Blog and play along, you just might win! MyStyleStamps - "Let's Rock & Roll"
Hi guys, hope everyone is having a beautiful Sunday. 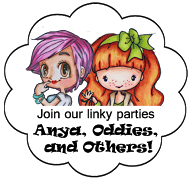 I currently am a new Designer for MyStyleStamps. This is a New Release "Sock Hop". To find out it's official release date, head on over to the MyStylesStamp Blog. Isn't she a cutie! This set has a 1950's theme. Her whole outfit is paper pieced. The only Copic coloring I did was her hair and skin. I added some glitter accents with Stickles Star Dust. 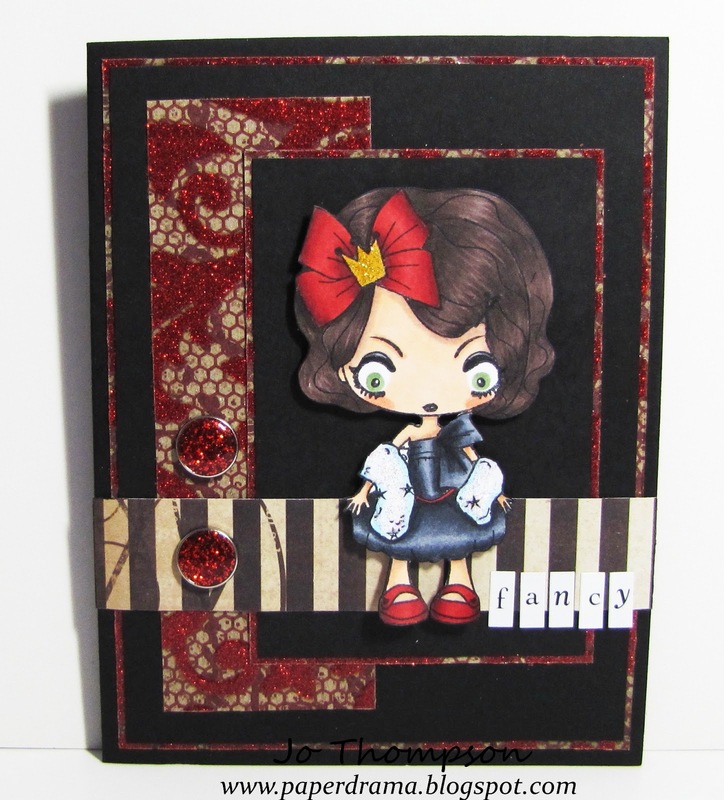 There's a border strip in the stamp set that I used in the background. I stamped a mini record three times to add little accents at the top of the card. "Let's Rock & Roll" is one of the six sentiments included. Here's a quick little video of my card. Thanks for stopping by. Enjoy the rest of your weekend! Today's challenge is to use Punches and/or Dies. I chose to use Dies from the Mini Clouds w/Die (cloud) and Film & Polaroid Die Set (heart). The houses and the sentiment are from the Dreamy Kit. The paper I used is from DCWV Sunday Afternoon. I love this paper stack! The little hearts on the houses are colored with a Copic marker and covered in Xmas Red Stickles, gotta have the glitter. I'm sure everyone has either punches or dies in their arsenal of scrap supplies, so come on over to the TGF Blog and play along with us! Hey guys, I'm hosting the Retro Fresh Challenge over at The Greeting Farm this month. Check it out, the theme is CUPCAKES & SPRINKLES! Yummers! Here is my card using Birthday Anya II, Delicate Words Die Set, Film & Polaroid Die Set and the Tulip Border. I was inspired to make this gigantic cupcake (card size of course) by my friend Gina. It's is a coffee sleeve and just a circle insert. How easy was that?! I just decorated it with a doily for icing and some pattern paper for trim. Anya is colored with Copics and also paper pieced. I added some polka dots to her skirt with a marker. I wanted to mimic the heart cherry on top of the cupcake on the Anya image, so I used the heart from the Film & Polaroid Die Set. The heart was too pointy, so I just did a minor trim to round out the edge of the point at the bottom. I hope you like the theme I chose. 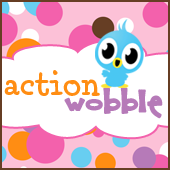 Come and play along over at the TGF Blog, you just might win! I used WS Charlotte Chic and the Film & Polaroid Die Set for this card. The die set comes with three dies, I used all them (film strip, Polaroid frame, heart). I love the dotting technique that I used to color her hair with my Copics. Her outfit is paper pieced. You might recognize the doily in the background, I used it on a previous card w/Cheeky Lessons. It's by far my favorite doily die. You might see it again in another project LOL. Inside the Polaroid frame, I place some vellum in the inner square and laid the heart die cut in the center. The filmstrip die was cut from kraft paper. To finish the card, I added some pearls and a wood Polaroid veneer. I loved playing with this color combo. Give it a try and enter to win over at the TGF Blog. Happy Fourth of July!! In celebration of this holiday, our Farm Fresh Friday theme is Red/White & Blue and Ribbon. 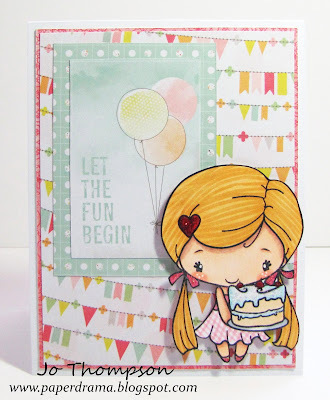 Here is my card using Cheeky Lessons and the TGF Fence Die from The Greeting Farm. I colored her with my Copics and added some polka dots with my gel pen. The fence is embossed with tiny stars. Across the top of the card is half a doily and a banner made from book text paper. I added some star die cuts that I colored with my blue Copic marker. I traced an outline of the star with a black fine point marker, added some faux stitching and some rhinestones. Last I added a black satin ribbon with a heart button w/blue & white twine and also the word "Party". I think my card turned out very festive. Hope you guys give this challenge a try over at the TGF Blog. Hey guys, I have another post for you today. 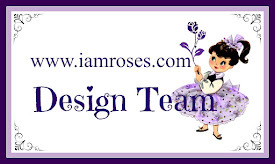 Here I am sharing my project that I made for the July Challenge over at the I Am Roses Challenge Blog. Here is the tag I made. 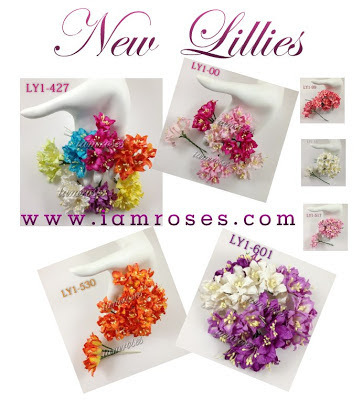 The featured flowers are the new Lilies (LY). Aren't they gorgeous. 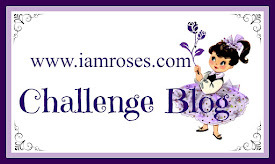 If you want to win some, head on over to the I Am Roses Challenge Blog for more details on this month's challenge. I finally gave in and got a Prima Dolls Stamp by Julie Nutting. I also used the coordinating Tag set. On the background of the tag, I sprayed some Lindy's Stamp Gang sprays in the colors Plumeria Pink and Creme Brulee Cream. The image of the girl is colored with my Copics and I paper pieced her entire outfit. One requirement of the challenge is to use vellum, here instead of using designer paper, I used vellum for my doily die. The paper collection I used is from DCWV the Primrose Collection. I made a cluster of the lilies, added some stamens and used seam binding for the ribbon up top. I had a leaf and mini butterflies punches by Martha Stewart and I used vellum for that also. At the bottom of the card is another cluster of lilies, stamens and vellum leaves. Underneath it all are some two toned maple leaves. Added some die cuts and pearls to finish off the tag. This was fun to make and the lilies are to die for! Come join us and enter to win the new Lilies!